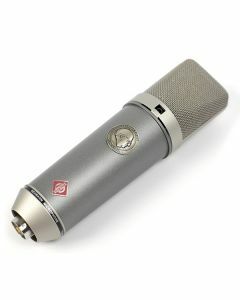 The TLM 67’s foundations were laid by Neumann’s legendary 1960s engine, the U 67. The TLM 67 combines the K 67 capsule as the U 67 did. This unique transformerless circuit design accurately replicates the soundscape of the classic U 67. Similar circuit technology has already proven itself to be reliable and of an industry leading standard in Neumann’s TLM 49. Three switchable directional characteristics (cardioid, omnidirectional and figure-8), selectable 10 dB pre-attenuation and high-pass filter allow for precise alteration and control. The end product is an incredibly versatile microphone, the TLM 67 is capable of fulfilling any engineering need. As opposed to utilising a conventional output transformer, the TLM 67 deploys an electronic circuit. As is the case with a transformer, the circuit guarantees good common mode rejection, efficiently subduing interference signals that affect the balanced modulation line. The microphone has a dynamic range of 94 dB, without the use of the pre-attenuation switch and can function without distortion at sound pressure levels of up to 105 dB. The pre-attenuation switch is situated to the rear of the microphone and on activation reduces transmission levels by 10 dB. Use of the switch shifts the microphone’s dynamic range by 10 dB, rather than expanding it. Therefore, its best use is to mitigate overloading following devices with excessive sound pressure levels. The other switch on the back of the microphone can be used to change the cutoff frequency of the built-in high-pass filter, so as to suppress the effects of impact sound and wind noise, or to compensate for the proximity effect.